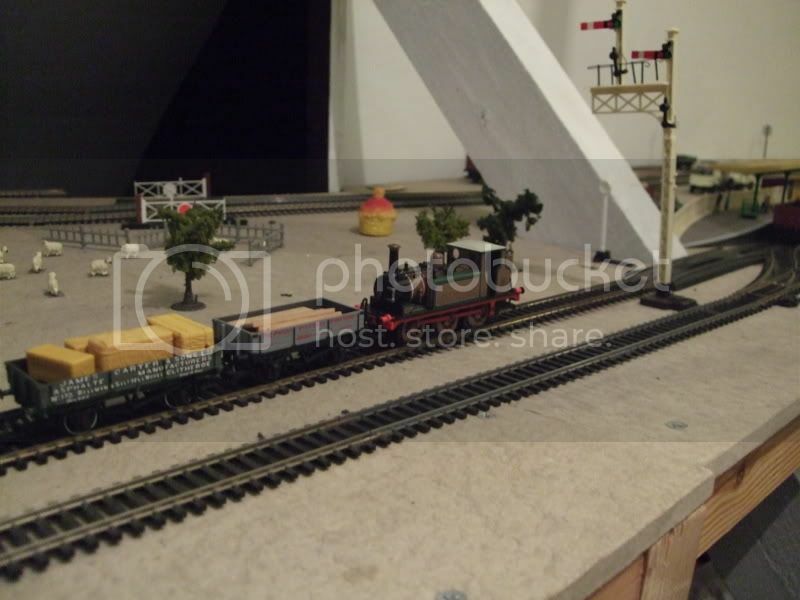 And lo, after much lurkage, I have decided to start a layout thread as I am finally in a reasonable position to make some decent viewable progress. This, coupled with some extremely enjoyable visits to the Bluebell, Watercress line, and a fish and chip supper on the Glocs and Warks Railway in the last year has spurred me on to convert my 'train set' layout into something a little more grown up. I have been hugely inspired by ElDavo's 'Cramdin Yard', Grotland's grotland!, pedanticmongrel's 'Wenchford, Black-Marlin's 'Starlingford' and mlevin's 'Levington' amongst others - their detailed work is a joy to behold. Whether I live up to that is another matter! As you can see - there's rather a lot of room! The baseboards were all constructed by my father when I was 15-16. He's fairly handy at woodwork, but there are the occasional problems with lofts. The sundeala tops have warped ever so slightly in places so there are lips of up to 5mm. I think these can be rectified with a plane - there are only a three or four places out of the 20+ separate boards where this has happened. 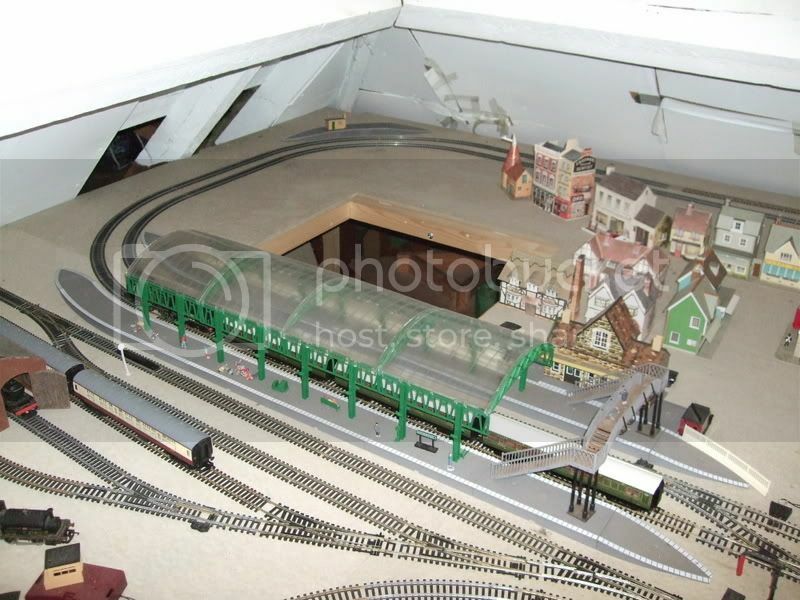 The layout is 00, and DC controlled. I am an electrical muppet - wiring even the simplest set of street lights sends me into paroxysms of fear! That's one of the reasons for joining a nice friendly community like this - for support, and a little hand holding along the way! 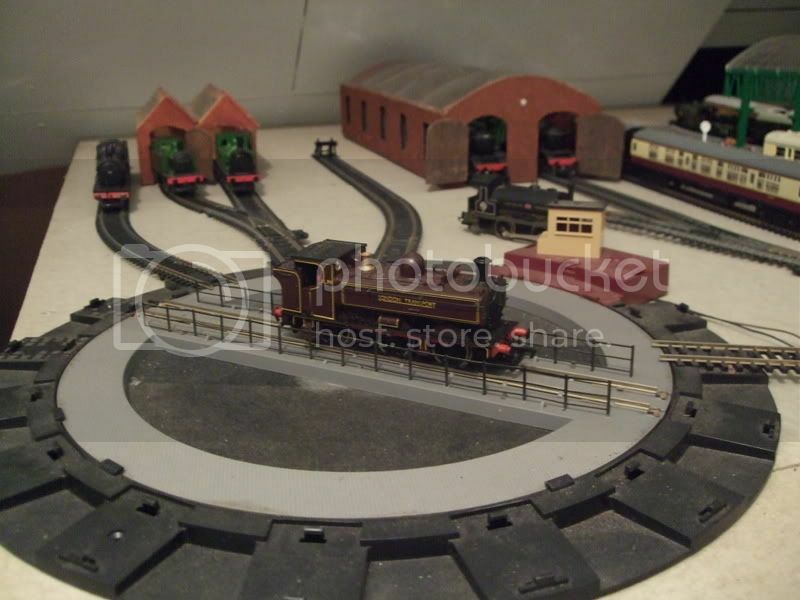 There are currently 3 roundy roundy ovals, and two shunting sidings, designed to allow two people to operate from two separate DC controlers at once. There are going to be considerable changes to this layout, and it's only a rough approximation of what I eventually want. More detail will follow. 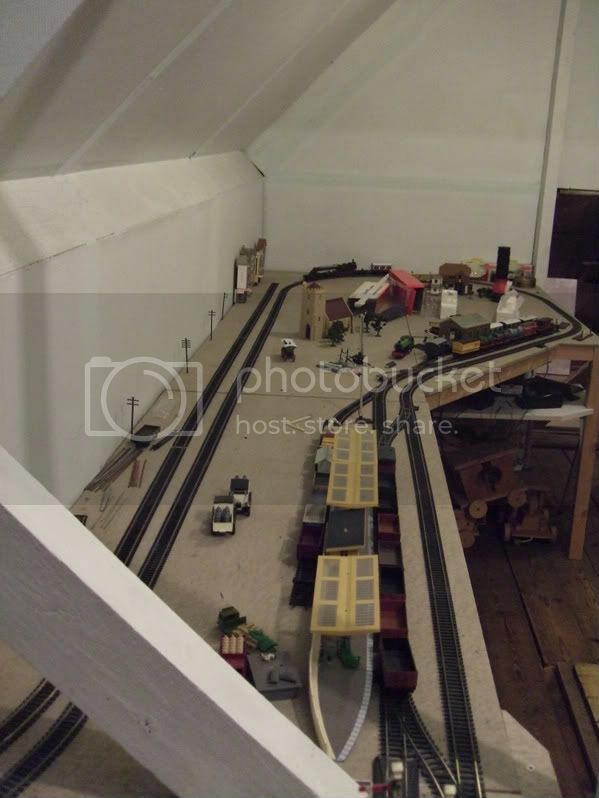 Future projects include a new fiddle yard area, long hidden lines behind the narrow section, and replacing all the points to Peco from Hornby, where I can. LT Transport Pannier (Bachmann). I was speaking to pedanticmongrel, who says this is quite rare! I'm fairly sure that's it in terms of locomotives, though on the list to purchase are a SR Q1, a new Schools and Blackmoor Vale - this as I primarily want to create a rolling downland scenario, with a small provincial town (the Hornby station with canopies is going - a relic of the childhood). Add to that a rake (all in 3s) of pullmans, an ancient rake of LNER Celestory, LNER Gresley teaks, GWR Chocolates, LMS Staniers, 5 new Hornby Maunsells, and a large collection of wagons and other rolling stock, and you have a fair approximation! More details to follow, but that's all I can manage for the moment whilst at work. I have particular queries to ask about troublesome double slips, and getting various trains to access different lines in the most economical way. Feel free to add constructive comments - I hope you like it! Last edited by Mighty on Tue Aug 16, 2011 11:07 pm, edited 26 times in total. Well welcome to the workers and dreamers corner of the forum !! 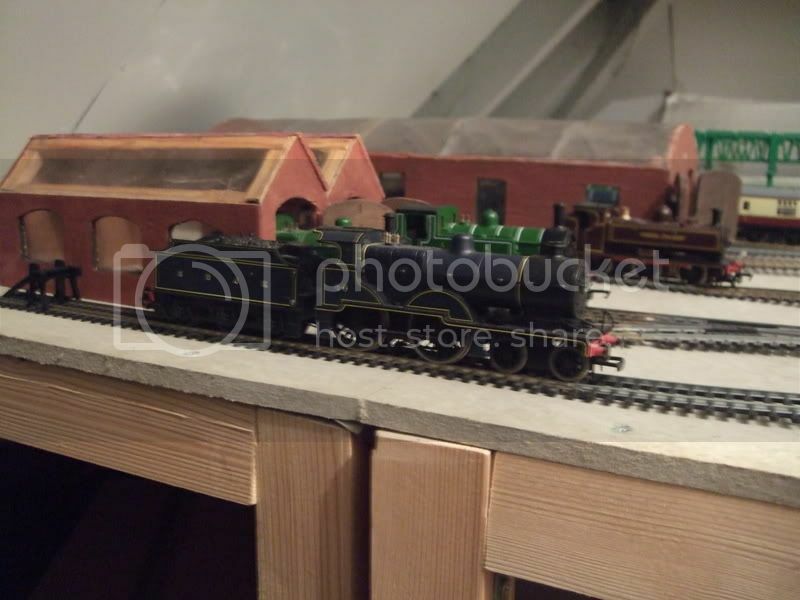 You certainly have some space in which to create something, although don't count the progress in weeks as space means a great deal of work, particularly ballasting, everyones favourite pastime. In comparison to many who claim to be beginners you do have a nice collection of motive power ..... will keep watching as you keep spending !!!!!! could I trouble you to answer some questions? Certainly! Insulating the loft was rather a big job. When we first went up there 9 years ago transferring from a board on the dining room table, there was nothing up there bar one small section which was floorboarded. The rest of the loft was floorboarded over a year working in small segments with loft floorboards you can get from B&Q. The loft is insulated with special silver foil with bubblewrap in the middle. I'm fairly sure this is from Wickes, but I'll ask my father. Essentially, you get a staple gun - dangerous things and not to be messed with - and staple the rolls, which come in 10m lengths, to the rafters. Allow a slight overlap on each one, then use insulating tape to cover the joins. We finished in December, and it's soooo much warmer up there now! The hatch! Look in the first photo - in the bottom left hand corner, there is a wooden pole sticking up. Below the bottom of the photograph is the hatch, which is a slide ladder with bolts to lock it into place. Fairly easy to get up and down. 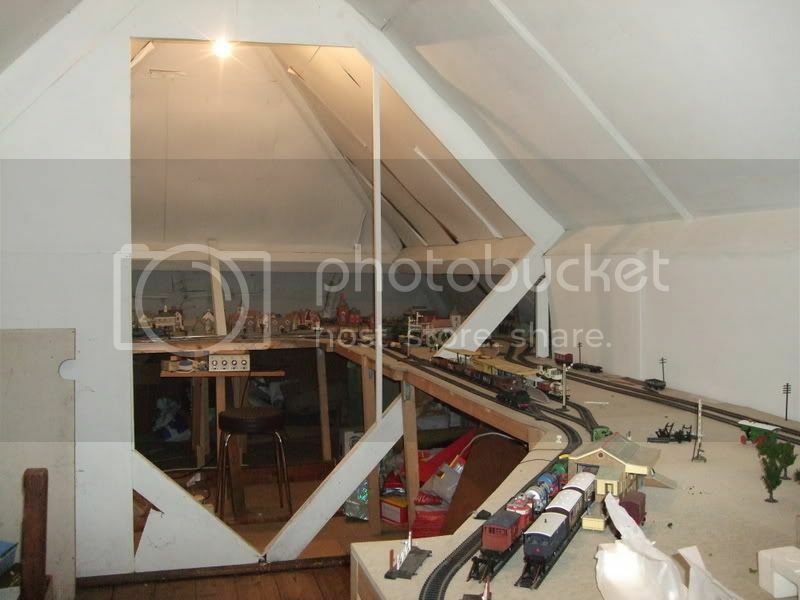 The hatch is also in the centre of the loft, so no problems if the layout did go round in a big circle, but to be honest, I've got so much space, if I had any more I wouldn't know what to do with it. If I want to extend in the future, there's space. However I'm not entirely sure how long my parents will stay here now we have grown up. It might be about 5-8 years - enough to get stuff progressing, but it also means that everything has to be dismountable! This will be a challenge, but I'm taking inspiration from exhibition layouts on the dark side forum (rmweb) about making sure that scenery can be taken down etc. All the legs and boards can be taken down, but we've never tried it! Finally, the military airfield will be going sadly. It's taking up too much room, and actually doesn't look that great close up. A backscene will be going down just behind, or in front of, those two access hatches. Dad-1 wrote: Well welcome to the workers and dreamers corner of the forum !! Thanks Geoff! There is sooo much space! I know it's going to be a long job, but I do have assistants. Step forward exhibit one - my father, and exhibit two, my very understanding girlfriend, who has promised to help if she can have a dragon on the layout! 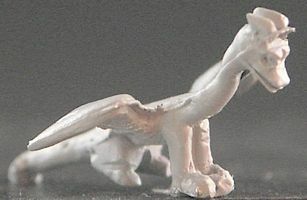 I fortunately found one in Dart Castings, which is 00 scale, very small, and paintable. As for ballasting, I'm strangely looking forward to giving it a go. I'm one of these people who likes to listen to the radio, so I'll probably switch it on, and get cracking for a few hours at a time. Your ancient j83, I'm no expert on old hornby or triang, but I can tell you that is in fact an LMS Jinty in LNER colours, Could be a rare item. 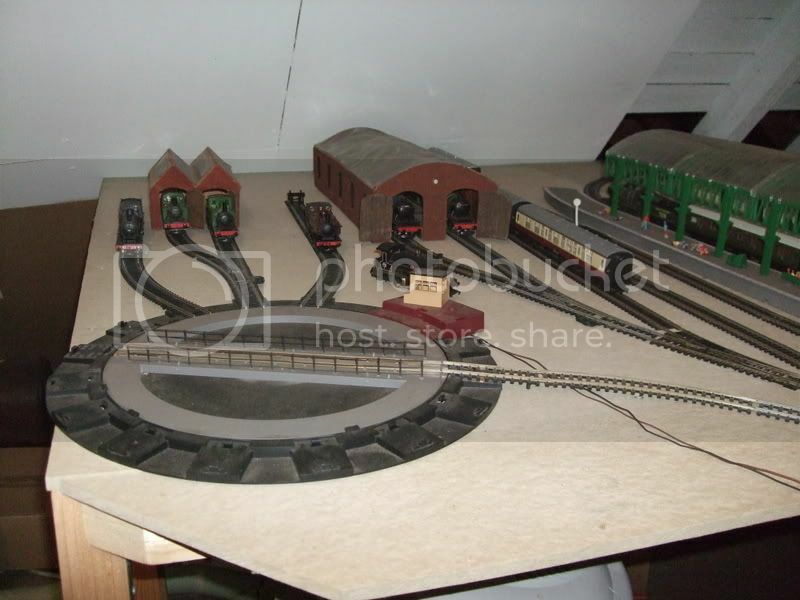 Need a hornby/triang expert to know for sure tho. Nice collection of engines you have there. I wish I'd kept mine from I was younger but I sold them on. Re: Mighty's Loft Layout - Yet more space! Progress! Photos to come, but a small fiddle yard area - i.e. a new baseboard - has been added at the end of the long thin set of boards. A hidden double track straight has also been added behind these long thin boards to enable scenic areas to just have one track, rather than too many unrealistic lines. The idea is to get the trains to run through the scenery, rather than the scenery be an add-on to the track. It's probably 70% complete - brackets in place, wooden plank cut to size, but I need to add some legs to a piece of sundeala to finish it all off. Hopefully this will be next week. Replacement track is the next thing on the list to purchase. 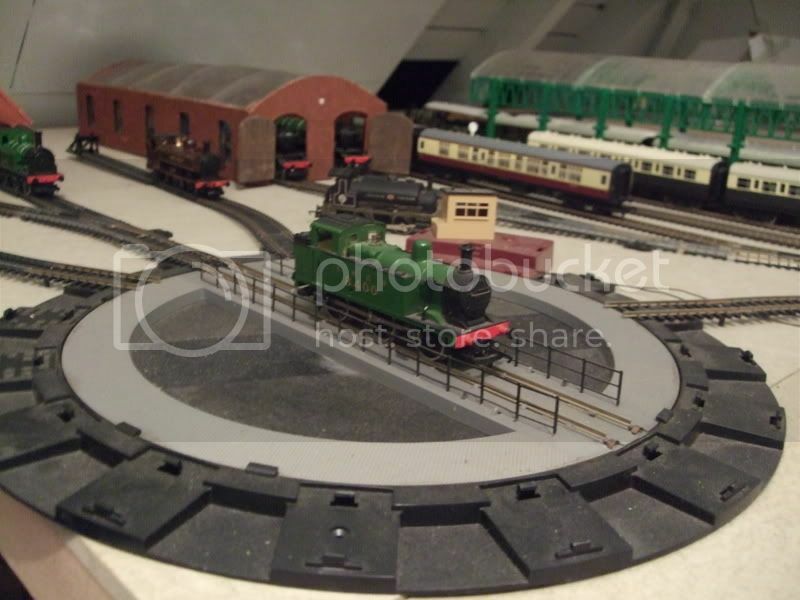 I am fed up with my locos derailing repeatedly over the Hornby set track points, so it's over to Peco medium radius. I'll be adding some double slips in too to cut down on the ridiculous pointwork near the station. I'm slightly unsure as to how to lay everything out, but I'll pop a couple of posts up with my ideas so far. Any advice would be welcome. 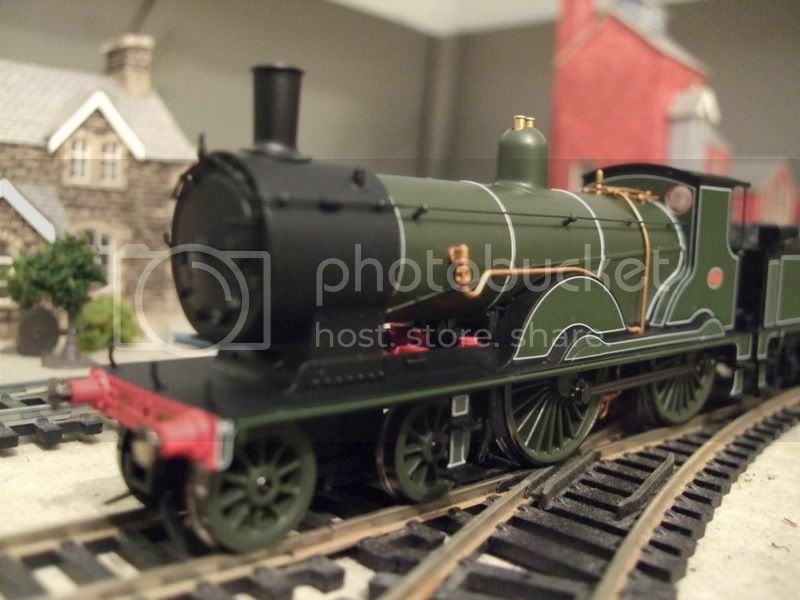 Pedanticmongrel wrote: Your ancient j83, I'm no expert on old hornby or triang, but I can tell you that is in fact an LMS Jinty in LNER colours, Could be a rare item. 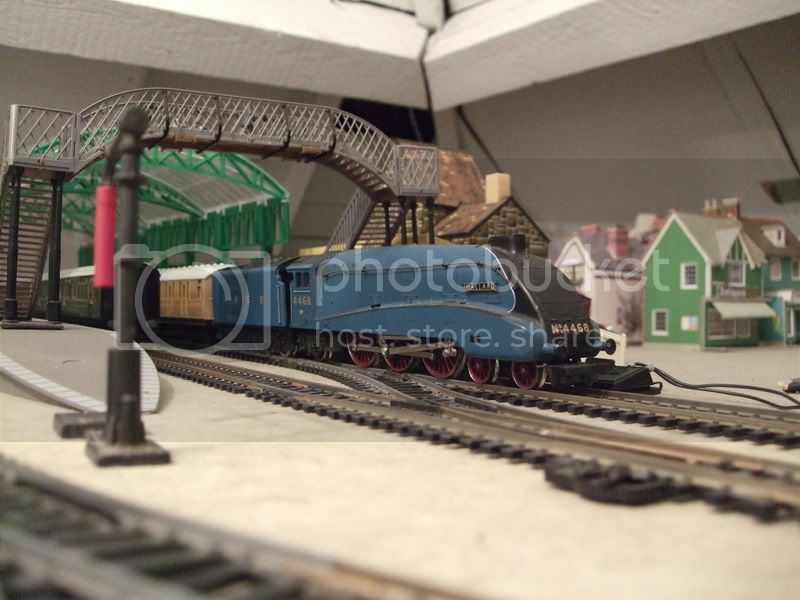 Need a hornby/triang expert to know for sure tho. I didn't know that - the livery made me make the rather obvious assumption. It came with my brothers very first train set 20 years ago. 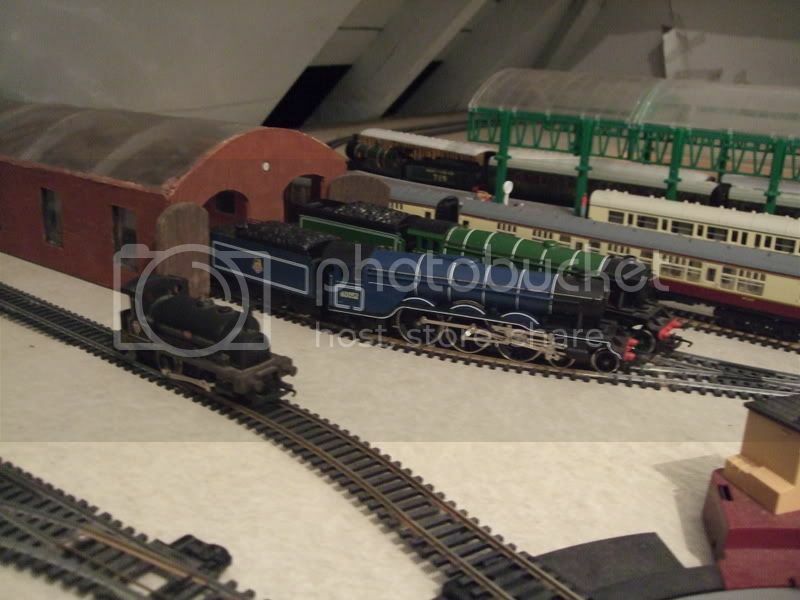 Sadly, it had to have a new motor, and the 3 LNER celestory carriages have seen better days - the odd buffer missing etc. Still, the new motor has given it a new lease of life, and it runs remarkably smoothly, even over pointwork. ChrisWV10 wrote: Nice collection of engines you have there. I wish I'd kept mine from I was younger but I sold them on. Mighty wrote: I do actually have a castle, built for me by my dad when I was younger, but it would dominate the whole layout - far too big! 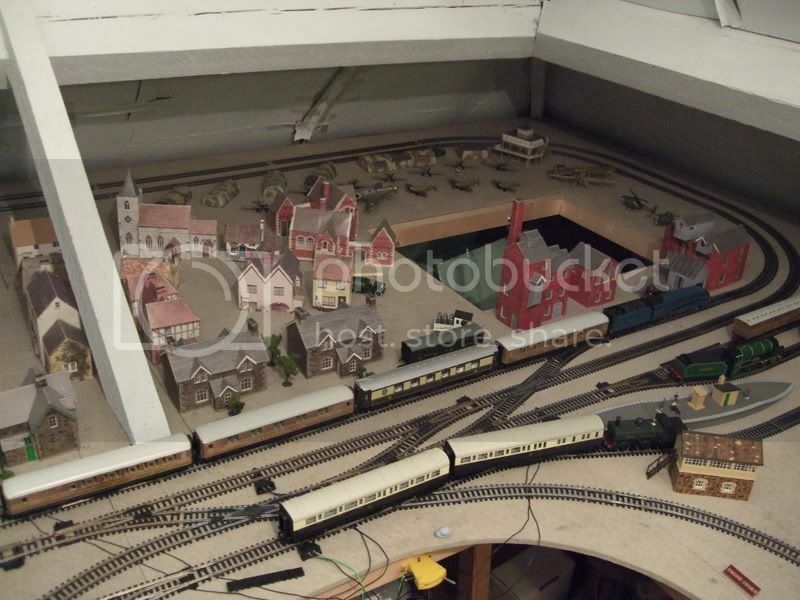 It's tempting having seen Black Marlin's Starlingford layout though! Hi Mighty - nice to see your layout thread at last! The castle on my layout is only about 10" x 10" - it's an old (very old) Airfix kit that has been immeasurably improved through (reasonably) careful painting and gaugemaster ivy growth. If you do consider having a castle, that might be the way to go - ebay is probably the place to check. As far as the airfield is concerned...I feel your pain. 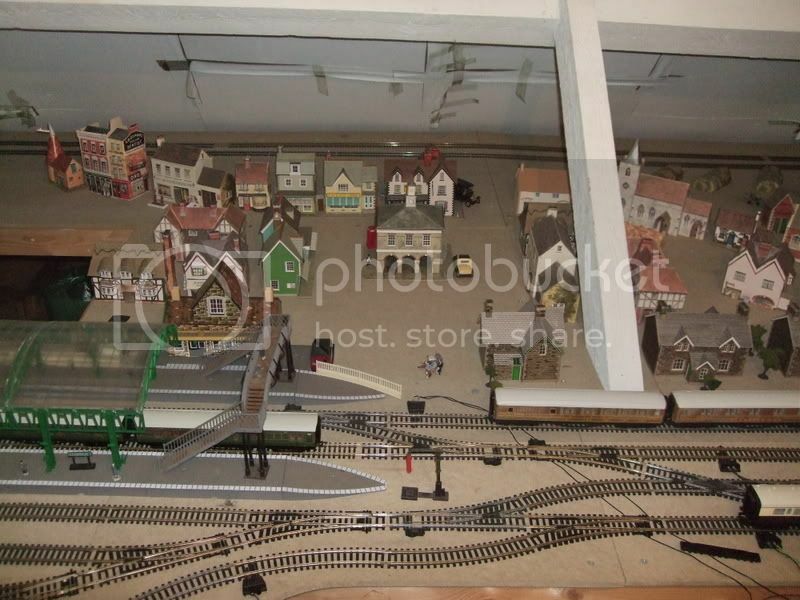 My previous layout, Wyndham, had an airfield in the middle and even with a 6' x 3' area (on a 10' x 5' board) it was just too cramped. (There are some pictures of it on the first couple of pages of Starlingford's thread). Still, you can always hang an aeroplane or two above the layout. Quite apart from it being a good re-use of old kits, it adds an element of verticality to the layout's area of interest, and that makes it just that little bit more involving for those watching. I have a model of a B-17 to build for precisely that purpose. But I'm looking forward to watching this layout progress! Tell me (he inquired, nosily and prematurely) have you given any thought to what you're going to call it yet? Re: Mighty's 00 Loft Layout - Yet more space! Black-Marlin wrote: But I'm looking forward to watching this layout progress! Tell me (he inquired, nosily and prematurely) have you given any thought to what you're going to call it yet? As for a name - no idea yet. I've been mulling it over for a while though. 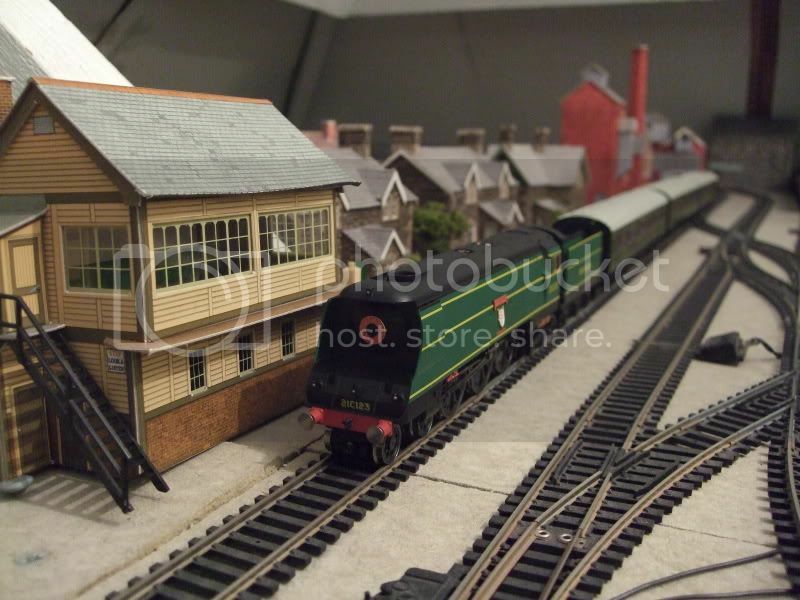 The idea is that it's supposed to be based in the South Downs, or thereabout - nice rolling hills and countryside, the odd farm, next to a small town with a junction for a branchline. I'm going to nick a few ideas from the 'Wartime' layout by Bentley MRG which I saw in a mag a few months back. Just let track on the long thin section run through the countryside. There will probably be two stations - a medium sized one around where the canopied one is atm, but without canopies and with scratchbuilt platforms. 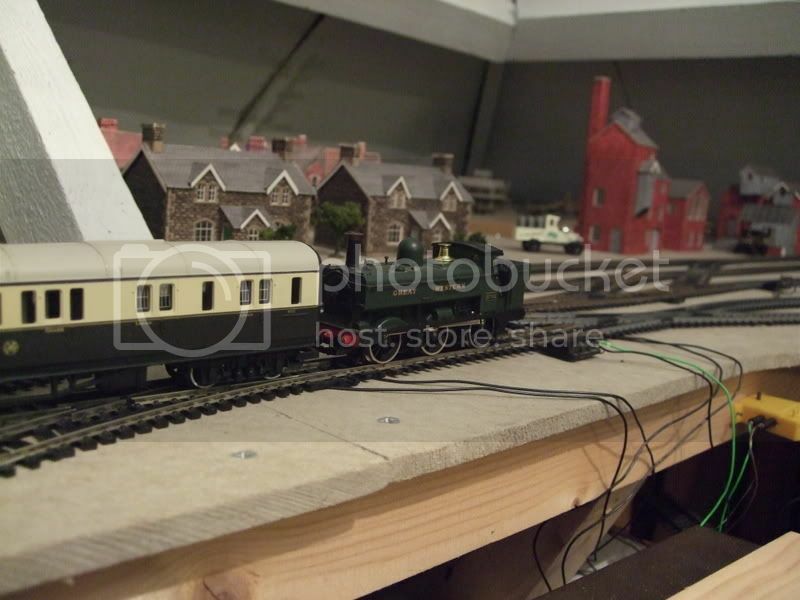 The second would be a halt with a few sidings on the long thin board before the line goes into the tunnel to the fiddle yard. Perhaps Upper and Lower xxxx? East and West xxxx? I might scour a map and find a the odd name for inspiration. If anyone has any ideas or suggestions, let me know! More pics of progress tonight when I get home. Oh dear - half way down page two, and all because of a plumber! Yes, that's right - my intentions to progress swiftly have been foiled by my parents deciding it would be a good idea for a new bathroom. So in come plumbers, electricians, plasterers etc, and for the last two weeks I've been unable to access the loft. So the little extension has had to put on hold at 70% completion, probably for another week or so. However, that doesn't mean I've not been busy. Oh no. Pre-ordered Schools class 'Charterhouse' in Maunsell Green. Very Nice! 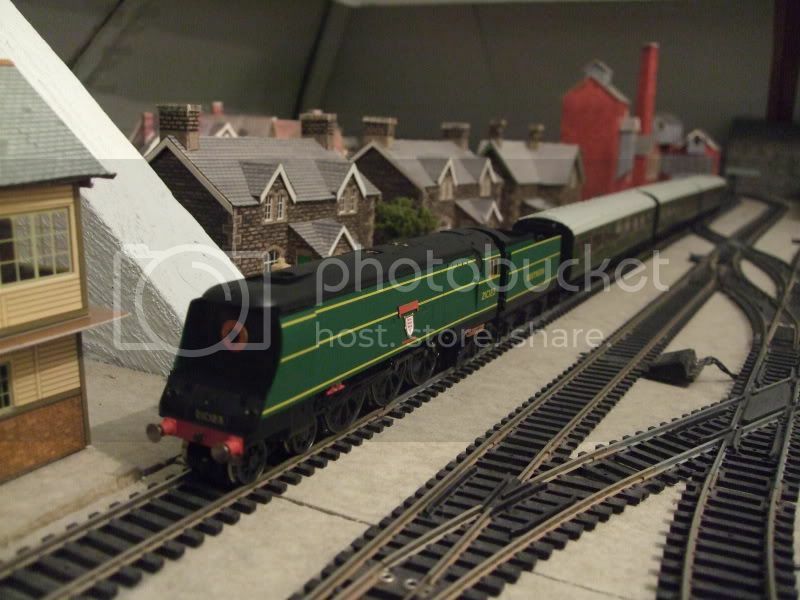 I have a Blackmoor vale and some of the new coaches, there great! yuch! Sorry I just can't stand the sight of the Bullied when they don't have the brake rodding on! mattmay05 wrote: Very Nice! I have a Blackmoor vale and some of the new coaches, there great! Cheers matt - I always wanted Blackmoor after going on the Bluebell, and it looks fantastic going round my layout at speed. Pedanticmongrel wrote: yuch! Sorry I just can't stand the sight of the Bullied when they don't have the brake rodding on! I only had five minutes Seriously, the house is a tip - I can barely get around anything, so getting up in the loft was an achievement. I'll fit all the detailing parts once I've relaid all the track etc. Now, are you two going to Ally Pally? I'll post up some more photos later. i am at the moment i cant say what day... and it wont be for very long possibly saturday for me.